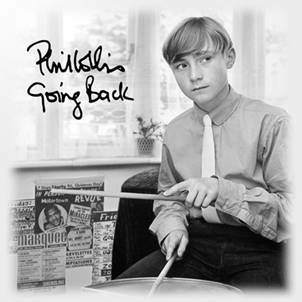 While the majority of covers albums by veteran artists in recent years have smacked of a marketing strategy — think of those by Rod Stewart or Barry Manilow — the new one by Phil Collins, Going Back, on which he interprets songs of Motown and other comparable classics, comes across as a genuine labor of love. Collins has long held a soft spot for vintage R&B and pop, and he's illustrated as much throughout his career, from scoring solo hits with the Supremes’ “You Can’t Hurry Love” and the Mindbenders’ “A Groovy Kind of Love” to including an oldies medley during “Turn It On Again” on past Genesis tours. Such affinities even more richly inform Going Back, which features members of the Funk Brothers — the Motown house band, which played on virtually all of the Detroit label’s signature material — who, besides adding credibility to the recordings, provide many a direct link to their history. At his best here Collins has a way of personalizing a song, not so much to make it his own but to convince listeners it’s theirs. And he succeeds most in doing so on relative obscurities like the Ronettes’ “Do I Love You?” and the Temptations’ “Girl (Why You Wanna Make Me Blue),” both evoking an air of wistful romance. Another noteworthy highlight is the Stevie Wonder ballad, “Blame It On the Sun,” which Collins renders with empathy and striking conviction. He struggles, though, on more vocally demanding tracks like “Uptight (Everything’s Alright)” and “Take Me In Your Arms (Rock Me A Little While),” the lack of agility in his voice calling to mind just how exhilarating the definitive versions (by Stevie Wonder and the Isley Brothers, respectively) sounded in the first place. That said, no one will mistake Collins’ singing in general for the likes of Smokey Robinson or Levi Stubbs, nor should they assume that he is even attempting to rival theirs or any other of the principal artists’ versions. Going Back is an homage, plain and simple, with which Collins honors the songwriters, musicians, and vocalists who inspired him to pursue his own musical path as a young man. That it comes, most likely, toward the end of his extensive career gives a sense of symmetry to what is overall an earnest, enjoyable album.